Work is now under way on the restoration of Delapre Abbey, funded by Northampton Borough Council and the Heritage Lottery Fund (HLF). In January, Robert Woodhead Limited was announced as contractor for the £4,700,000 million (construction value) project which will see the Grade II* listed building’s transformation from derelict site to tourist attraction. The Heritage Lottery Fund (HLF) has pledged £3.65 million for the project, which will be rounded up to £6.3 million by Northampton Borough Council and other sources in total. Chris Weiss, project quantity surveyor for Woodhead Heritage, said: “The first activity on site will include the set-up. “Our cabins have now arrived on site, and the hoardings have been installed and will be decorated over the next few weeks. “We will then begin to adapt the scaffolding surrounding the main abbey, which will enable us to progress the stone cleaning, masonry work and window repairs. The project forms an important part of the Northampton Alive programme of regeneration, which aims to respect the town’s heritage while ensuring progress takes place. Cllr David Mackintosh, leader of Northampton Borough Council, said: “Delapre Abbey is steeped in history. “It started its life as a Cluniac nunnery and has been gradually added to by successive generations, giving it a unique character. “The grounds were also the site of the Battle of Northampton, one of the most important clashes in the Wars of the Roses, and what is perhaps the oldest surviving cannonball in England was recently uncovered. Roofing work was completed last year thanks to a £200,000 grant from English Heritage, work which was required before the main restoration could start. 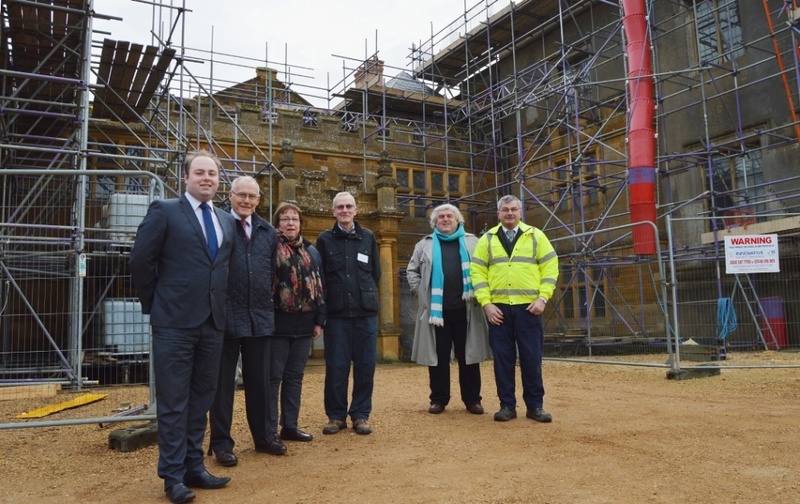 Rod Giddins, chairman of the Delapre Abbey Preservation Trust (DAPT), said: “The trust is delighted that restoration work is now starting in earnest, following months of intensive preparations to reach this stage. “We look forward to continuing our close partnership with the council over the coming months as we work on the detailed operational plans. Dee Whitehouse, chair of The Friends of Delapre Abbey, said: “The friends and the wider community have fought long and hard over the years to save the abbey and we are relieved and thrilled to see that at long last the restoration work is now commencing. Picture: (l-r) Cllr David Mackintosh (NBC leader), Cllr Tim Hadland NBC cabinet member for regeneration, enterprise and planning), Dee Whitehouse (FoDA chair), Rod Giddins (DAPT chair), Adrian Bell (FoDA deputy chair) and Richard Carlton.